One of the most important metrics for my business is net revenue, but it’s a harder number to find than you’d think. You had $11,000 of gross sales, and $1,000 of refunds, then EDD shows you $10,000 as the total. Sounds ok so far. The problem I had is that refunds are only counted if the purchase date was this month. This may not seem like a big deal, but it can actually cause the monthly total to be off by thousands. For example, let’s take the numbers from above, but you give another refund for someone who purchased last month for $500. You issue the refund, and your earnings this month still show $10,000, not $9,500. Your earnings for last month go down by $500, but not this month. I am only able to put $9,500 in my bank account this month, but my sales show $10,000. That may not seem like a big deal with these numbers, but the problem gets worse with higher revenue. 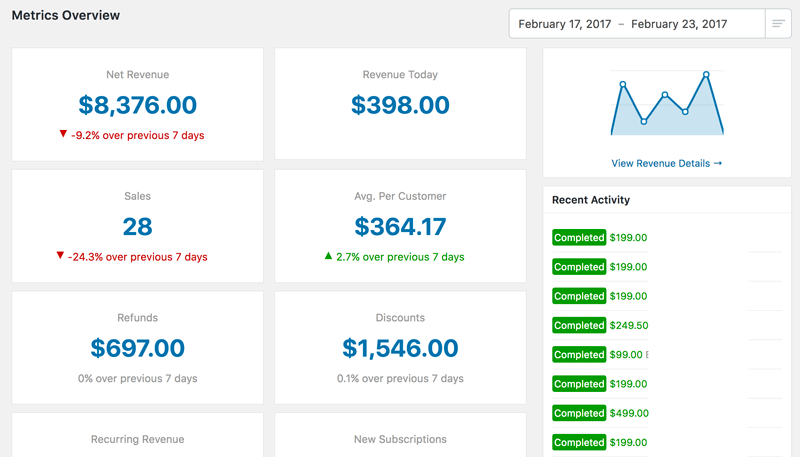 I also added recurring revenue stats with comparisons, and made some other improvements. Download version 0.6 from wordpress.org. To be clear, I’m not accusing EDD of doing things the wrong way, I just prefer to see my revenue numbers a different way than they do it. That’s why I made my own plugin. Net is king! It amazes me how gross revenue is highlighted in business most of the time. Fact is, that – gross – does not represent your money. To me – the issue seems to be more about how you display the data in your tool. Wouldn’t selecting “Last Month” versus “Last 30 days” resolve this issue? Or was this what was added to the .6 update?